Ergonomics are excellent with the Makita 12V Max CXT 2-Tool Kit. The light weight of both tools is greatly appreciated and they are more than capable of handling basic drilling and driving duties. Do 12V cordless tools really have a place in the professional’s tool box? Ummm… yeah! Some people write off 12V tools as being the DIY version of the professional grade cordless models, but that’s simply not the case. Tools like the new Makita 12V Max CXT 2-Tool Kit offer compact, lightweight performance with the same kind of quality you expect from a brand’s 18V class. Yes, 12V is less powerful than 18V. Still, a professional level drill/impact driver kit will handle 80% of the fastening and drilling you do. Anytime screw driving is involved, there’s just no reason to use a tool that’s a couple pounds heavier. Tom Gaige, a Pro Tool Reviews team member with more general construction experience than most, goes to his 12V kit virtually every time he’s working on low stress applications. Hopefully I’ve made my case that pros really can and do use the 12V class pretty frequently in fact. By far the most common applications are going to be drilling holes and driving screws. We got our hands on one of Makita’s new CXT 12V kits that now take advantage of a slide style battery pack with integrated LED indicators. We’re going to put it through a series of tests to see what kind of performance you can expect in a much more compact package. I got caught up before I even opened up the case. Why? Because the case Makita chose to go with is one of the best I’ve seen. It’s a little more boxy than the traditional rectangular style. Inside, a custom foam insert secures the tools, batteries, and charger in place along with a pocket to hold your documentation. I hope this is a case design that shows up with more of Makita’s new tools. Both tools in the Makita 12V Max CXT 2-Tool Kit are what you’d expect from the 12V class. The FD05Z drill/driver features a 3/8″ keyless chuck and 2-speed motor. At just 2.48 pounds with the battery it’s lightweight. It doesn’t seem as compact as you’d expect at first. It’s 7-7/16″ long, but it’s much thinner than it’s 18V cousins. It’s a similar story with the DT03Z Impact Driver. Weight is just 2.30 pounds, but the 6″ length is noticeably longer than the XDT09 18V Impact Driver. It also is much thinner than the 18V model. Both tools have Makita’s solid ergonomic physical design. One thing to note – these tools aren’t compatible with the Makita 12V pod style batteries, so you’ll need to get the new batteries if you’re jumping into the 12V Max CXT family. One of the benefits of owning a drill/impact driver combo kit is the ability to drill with one tool and drive with the other to avoid changing bits. That’s at the heart of our testing along with some light duty wood boring. 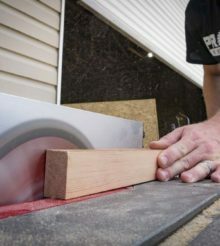 We used the same drilling test we put the heavy duty 18V drills through in our recent shootout – twelve 1/4″ holes into five stacked sheets of 3/4″ plywood. We dialed down the spade bit to a 3/4″ size to see what the drill could do in a wood boring setting. Working in high speed, it took the 12V Max CXT drill 55.1 seconds to create the 12 holes. It struggled a little bit with the 3/4″ spade bit, but averaged 41.5 seconds to break through our five sheets of plywood. Boring clearly ran down the battery pretty quickly. Our takeaway is to stick with standard twist bit drilling unless you’re able to give the battery time to charge before using it again. Otherwise, go ahead and reach for the 18V drill. The 12V Max CXT impact driver got some of the same treatment from our 18V impact driver shootout by driving twenty-five 3″ drywall screws into our plywood as fast as it could. It took 2:00 flat to drive all 25 screws. Even though it’s not as fast as the 18V model, it was able to sink screws well beyond the surface of the wood with seemingly little effort. Ergonomics are excellent with the Makita 12V Max CXT 2-Tool Kit. The light weight of both tools is greatly appreciated and they are more than capable of handling basic drilling and driving duties. Like other 12V kits that we’ve tested, these are really designed to be light duty specialists that take the load off of you when using them. There are options out there with more torque for both tools, but where Makita continues to stand out is in ergonomics. Both the physical design and feel under load are a step ahead of the competition. Even so, be on the lookout for brushless models to hit the market soon. Those may bridge the gap to higher power. Rewelacyjne narzędzia . Zakupiłem ten komplet i jestem bardzo zadowolony .